Between the 1870s and 1930s, Boston's Chinatown was the heart of the Chinese American community in New England, which stretched from Rhode Island in the south to Maine in the north. MIT's Chinese students maintained multifaceted connections with the Chinese American community, regarding Chinatown not only as a place to enjoy the familiar tastes and customs of home, but also as a vibrant node for interaction with their countrymen abroad, including both workers and merchants. The students were in turn acknowledged as "one camp" of the Chinese American community in the Chinese Directory of New England (1931), which published a full-page listing of the MIT students. Patriotic concern for China, especially in reaction to Japanese encroachment during the 1920s and 1930s, helped unite the Chinese American community across class lines. Chinese Boy Scouts on Oxford St. in Boston Chinatown, ca. 1938. Image courtesy Beverly Wing. Dedicated to the ideal of "saving China through science and technology," MIT's Chinese students were also influenced by the Chinese Students' Alliance's call for the overseas students to "labor for the welfare of China at home and abroad." Some of the MIT students took action by volunteering in the local Chinese American community. In 1910, for example, a group of MIT and Harvard students established a school for working-class Chinese in Boston Chinatown, teaching Chinese, English, math, history and citizenship in order to "better the lot" of their less privileged compatriots. In the 1920s, MIT Chinese alumni and students joined together to revive the Chinese Boy Scouts Troop in Boston Chinatown, working with youth to inspire their advancement. In the 1920s and 1930s, Chinese Students in the Greater Boston area united with Chinese laborers and merchants in patriotic activity ranging from famine relief in China to fundraising campaigns to support China's fight against imperialism and Japanese aggression. Also in the 1930s, MIT alumnus David Henry Kiang, the first Chinese to earn a license as a practicing physician in New England, helped launch an anti-tuberculosis drive among the New England Chinese. Many of the student community service and fundraising activities were generously underwritten by Greater Boston Chinese merchant associations. The merchants thus became a crucial source of support, material and moral, for student community engagement and patriotic action. Advertisement from the MIT Chinese Students' Directory, 1931. Courtesy MIT Archives and Special Collections. 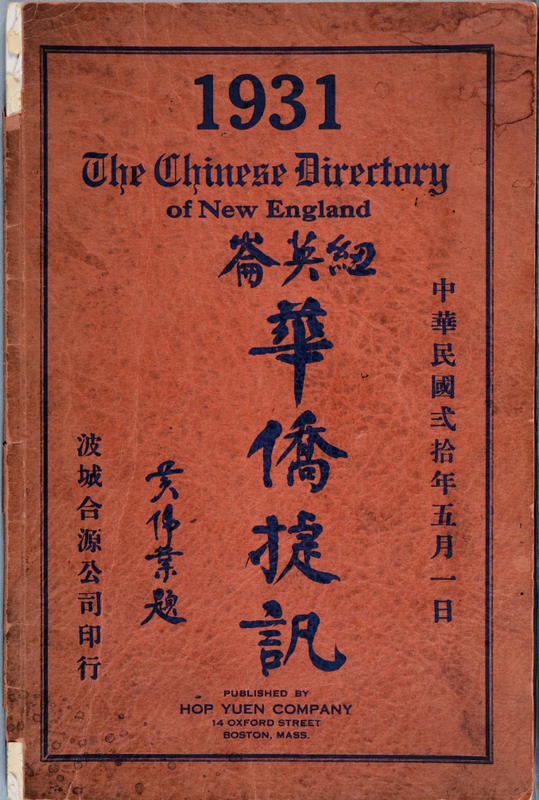 The Chinese Directory of New England, Hop Yuen Company, 14 Oxford St., Boston, 1931. Image courtesy Stephanie Fan. Chinatown was a center for Chinese businesses of all kinds. Advertisements in the MIT Chinese Students Directory provide hints of some of the businesses, including restaurants, laundries, tailors, nightclubs, and import-export shops, likely frequented by Chinese students. The Joy Hong Low restaurant on 8 Tyler St., for example, advertised "genuine" Chinese food, while Red Rooster at 11 Hudson St. promised "both Chinese and American foods." The advertisements are also reminders of the important role played by Greater Boston Chinese merchants in supporting student activities – in this case by purchasing advertisements to offset the costs of producing the directory. Over the years, the Chinese Students' Club came to embrace the importance of maintaining "friendly and working relations with the Chinese merchant organizations in Boston in matters pertaining to the well being of China." The merchants, on their side, invited the students for the annual grand Chinatown banquets to celebrate the "Double Tenth" (October 10) day, the Republic of China's equivalent of July 4th. MIT alumni also established businesses or residences in Boston Chinatown, joining the merchant class. Fu Cheng Chan (Class of 1924, Mechanical and General Engineering) of Swatow, China, for example, launched a business as an importer and exporter of Chinese Art Goods at 56 Tyler St. in Boston: where he advertised himself as "glad to discuss and help solve difficult problems." Winton David Bee/Pih Wei Dung (Class of 1925, Electrical Engineering), a native of Jiangsu, China, worked as a manager at the Mah Jong Restaurant on Tremont Street in Boston. Bee later became the manager of Hon Loy Doo Restaurant on 9 Tyler Street, now the China Pearl Restaurant. In the early 1930s, Bee harbored hopes of returning to China to work as an engineer when conditions there had settled, but the continual conflict in his homeland prevented him from doing so. Bee used his position as a restaurant manager to become a community leader. Under Bee’s management, the Mah Jong was the site of patriotic activity in support of China during the tumultuous 1930s, including the founding of the Save Our Country Patriots Club. For many years, Bee played a crucial role as a figure who could mobilize workers, merchants, and intellectuals, and also effectively bridge the Chinese and Anglo-American communities. William Ding Moy, ca. 1915. Image courtesy Beverly Wing. Before the construction of MIT's dormitories, many Chinese students lived in boarding houses in Boston's Back Bay and surrounding neighborhoods, with St. Botolph Street especially popular. A number of students, however, called Boston Chinatown home. William Ding Moy (Class of 1920, Mechanical Engineering), Albert Chen Shue (Class of 1924, Civil Engineering), Samuel Orne Moy (Class of 1929, Mechanical Engineering), George Orne Moy (Class of 1931, Electrical Engineering), and Arthur Orne Moy (Class of 1932, Mining Engineering) – had grown up in Boston Chinatown; and Y. Y. Wong (Class of 1925, Architecture), a native of Guangdong, immigrated to the US and attended the Quincy school during his youth. Eager to give back to the community, these men were involved with the revival of the Chinese Boy Scouts Troop in Boston during the 1920s. A native of Jiangsu, David Henry Kiang completed medical school at Yale in China, and was also a Rockefeller Foundation Fellow before coming to the US in 1928. Having studied biology and public health at MIT, Kiang entered private practice in Boston. In the Chinese Students’ Directory of 1931, Kiang listed his work address as 15 Hudson St. and his home address as 72 Tyler St. in Boston. Advertisements from the MIT Chinese Students' Directory, 1931. Courtesy MIT Archives and Special Collections. William Moy-Ding, Technique 1921, p. 121, George Moy Orne Technique 1931, p 99, Arthur Moy Orne, Technique 1932, p 87. Courtesy MIT Archives and Special Collections. Notes: On the Welfare School: HT Shen (Class of 1909, Naval Architecture) was one of the founding organizers. In 1913, HK Chow (Class of 1914, Mechanical Engineering and Naval Architecture) was President, VF Lam (Class of 1916, Naval Architecture), Vice-President, CS Hsin (Class of 1914, Marine Engineering), English Secretary, and T Chang (Class of 1915, Chemistry), Treasurer. Seven out ten teachers that year were MIT students, with Course XIII again very well represented: HK Chow, Frank Yeh and VF Lam taught English, while Long Lau (Class of 1914, Mining Engineering), PY Loo (Class of 1916, Mechanical Engineering), and YM Chu (Class of 1914, Electrical Engineering) taught math, and T Chang (Class of 1915, Chemistry), Mandarin. In 1914, VF Lam served as director of the school, while Long Lau, H Chen (Class of 1915, Chemistry), TS Chu (Class of 1916, Naval Architecture), and CC Tseng (Class of 1915, Electrical Engineering) served as teachers. Other new MIT members of the Welfare Association that year included: C Wang (Class of 1916, Naval Architecture), T Yuan (Class of 1916 Naval Architecture and Marine Engineering), and TC Mar (Class of 1916, Naval Architecture). CC Chu (Class of 1916, Naval Architecture) led the effort to establish a Chinese library through subscription, providing newspapers and magazines from China. Sources: Chinese Students Directory: For the Past Fifty Years, n.p. : Cambridge, Mass., MIT 1931, 60-63, The Chinese Directory of New England, Hop Yuen Company, 14 Oxford St., Boston, MA, 1931, 39, Constitution of the Chinese Students' Alliance in the United States of America, Article II, Section 3 (a). Chinese Students’ Monthly [CSM] 5.1, Nov. 1909, p. 5, Weili Ye, Seeking Modernity in China's Name: Chinese Students in the United States, 1900-1927, Stanford: Stanford University Press, 2001, 83, 99, Wang, Zuoyue. "Saving China through Science: The Science Society of China, Scientific Nationalism, and Civil Society in Republican China." Osiris 2nd Series 17 (2002): 291-322, CSM 5.7, May 1910, 419-431, CSM 5.1, November 1909, 5, Ye, “CHINESE SCHOOL CLOSES,” Boston Daily Globe, June 13, 1910; p. 5, CSM 10.2, Nov. 1914, 108, CSM 11.8, June 1916, 600-601, CSM 13.6, April 1918, 326-327, 357, The Chinese Students' Christian Journal, Volume 5.1, Nov. 1918, 63, Technology Review, vol. 16, 1914, 667, CSM 19.4, Feb. 1924, 71, Christian China (journal of the Chinese Students' Christian Association in North America, renamed Feb. 1920), volume 6.7, May-June 1920, 454-455, Christian China 7.6 (April 1921), 307-308, The Chinese Students' Christian Journal, volume 5.2 (Jan. 1919), 67-71, “CHINESE SCOUTS TO DRILL,” Boston Globe, May 18, 1912, p. 10, "Technology Chinese Active in Boy Scouts Work," Technology Review, vol. 23, no. 4 (November 1921), 571, “BOSTON CHINESE BOY SCOUTS REVIVE PICTURESQUE TROOP,” Boston Globe, Sept. 29, 1921, p. 2, "CHINATOWN PROUD OF IT'S BOY SCOUTS --AND IT HAS GOOD REASON FOR IT," Boston Daily Globe, July 23, 1922, 61, “RAINBOW TROOP OF SCOUTS OF BOSTON COMPOSED ENTIRELY OF CHINESE BOYS,” Boston Globe, Jan. 15, 1931, p. 13, CSM 16.4, 301, CSM 16.7 533, The Handbook of Chinese Students in the USA, 1932, New York: The Chinese Student Handbook Company, 1932, 53, CSM 16.2, 151-152. “CHINESE HERE MARK REPUBLIC'S BIRTHDAY,” Boston Daily Globe; Oct 13, 1924, p. 10, "MORE THAN $100,000 SENT TO DEFENDER OF SHANGHAI." Boston Globe, Feb 28, 1932, p. A19, “CHINESE HERE RAISE $17,000 FOR PLANES,” Boston Globe, Aug 14, 1937, p. 1, Gu, Yiqiao, One Family--Two Worlds. Philadelphia, Pa.: 22G Academy House, 1420 Locust St., Philadelphia, 1982, 48, "CHINESE Y.M.C.A. BODY INSTALLS NEW OFFICERS," Boston Globe, Jul 22, 1929, pg. 12, "ACT TO RID CHINESE OF TUBERCULOSIS: Groups to Begin Drive in Boston's Chinatown," Boston Globe (1928-1960); Mar 31, 1932, pg. 23, "OFFICIALS GREET CHINESE FLYER," Boston Globe (1928-1960); Nov 20, 1928, pg. 10," 700 Chinese and Americans guests at wedding banquet," Boston Globe (1936, Dec 22), "SIX-DAY FESTIVAL FOR GOON TOO NGAY," Boston Globe (1935, Jun 10), "CHINESE RECEPTION TO PROF JOHN DEWEY," Boston Globe, Apr 4, 1931, pg. 11, "CHINESE HERE SEND SZE COMMENDATION: MERCHANTS AND STUDENTS PRAISED," Boston Globe, Jan 12, 1932, pg. 11, "BOSTON CHINESE JOIN IN PROTEST: Message Against Japanese Invasion Sent Stimson," Boston Globe, Sep 24, 1931, pg. 4, "MORE THAN $100,000 SENT TO DEFENDER OF SHANGHAI." Boston Globe, Feb 28, 1932, pg. 7, "CHINESE ARBITRATION COURT HEAD HONORED: JOHN WONG AND ACTRESS SISTER," Boston Globe, Apr 24, 1931, pg. 19, Boston Globe, Jan 9, 1931, pg. 12, "CHINATOWN STAGES NEW YEAR CELEBRATION FOR AMERICANS," Boston Globe, Feb 12, 1937, pg. 8, "CHINESE HERE RAISE $17,000 FOR PLANES: BEE WARNS OF PERIL TO WORLD IF JAPAN," Boston Globe, Aug 14, 1937, pg. 1.